With this being my first race of the season, the goal going into it was to simply practice racing. Learning how be controlled early on, staying composed while in a pack, and changing gears late in a race are all key race tactics that I am going to need to employ later on this season when I get in bigger, more competitive races. Being able to come out here and practice executing each of those tactics in a low-key environment is incredibly valuable for my training, and will absolutely help me be successful later on down the line. 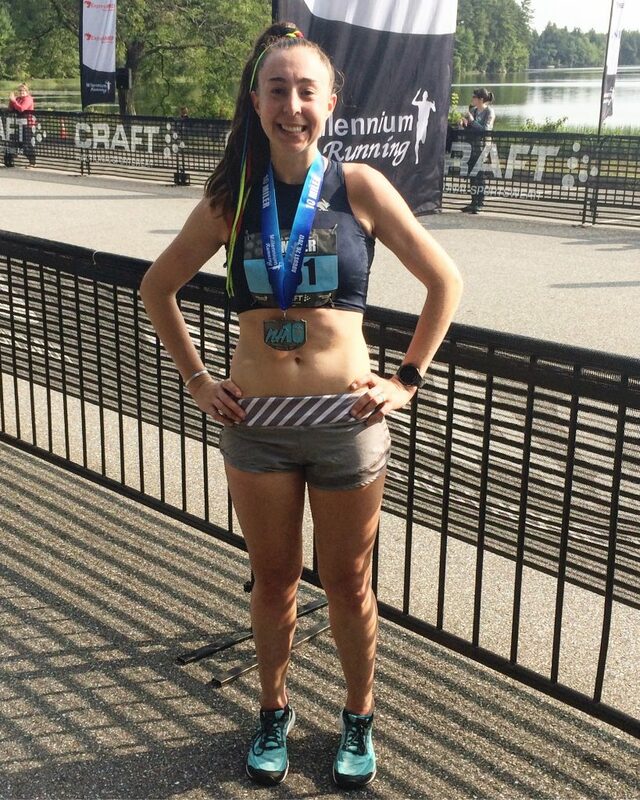 Rachel Schilkowsky kicked off her fall racing season in stellar fashion this past Saturday as she snagged the win at the CRAFT Sportswear NH 10 Miler. She traversed the hilly but picturesque course around Manchester, NH’s Lake Massabesic in 59:43, a minute and 17 seconds ahead of the second place female finisher Kaitlin Sheedy of Craft Concept Racing. In addition to being the first female finisher, Rachel also placed 5th overall in the race which included 1000+ competitors. After taking second in 2016 to Heather Cappello of the BAA, Rachel returned this year hoping to contend for the win. Having been through the course once before – and having suffered the effects of pushing too hard before reaching the massive hills in the second half of the race (see the elevation profile below) – Rachel’s race plan was simple: run smart. With such huge ups and downs scattered throughout the course, maintaining a consistent pace was virtually impossible, so she worked on maintaining a consistent effort. “Last year I was vastly under-prepared for how hilly this course is because all my training in Boston (where she lived at the time) was on flat surfaces along the Charles River or around a pond or reservoir. Since moving to Providence two months ago, I have certainly gotten in my fair share of hill running! As frustrating as it can be sometimes to constantly encounter hills on my easy runs, I must admit it has made me a lot stronger as I felt infinitely more relaxed and powerful as I tackled those same hills on the course this year”. For the first four miles of the race, which were “sneakily flat”, Rachel focused on staying relaxed and maintaining an even pace. By the time she hit the first mile marker, she had 15 seconds on the next woman, so she settled in with a small pack of gentlemen who were running right in her range. “Thank goodness for those guys!”, she exclaimed afterwards, “It can be really lonely sometimes in these long races, especially when you breakaway early, so being able to latch onto that group of guys was key. Not only did it help me get rolling those first couple miles, but it allowed me practice staying relaxed while in a group, which is something I know I need to work on for my bigger races this fall”. After cresting the final hill at the end of the 9th mile, Rachel cruised through the final, mostly downhill, mile of the race in 5:40 – her fastest mile split of the day. Her finishing time of 59:43 was quite close to that of last year’s race – 59:30 – which she felt was a sign of good things to come. “Last year when I ran here, I had three weeks of workouts and a five mile race already under my belt. To come here and run only 13 seconds slower in my first real hard effort of the season tells me I am on par if not ahead of where I was this time last year, which is great because last fall was my best season in years! I’ve got big goals for myself this season, particularly in the half marathon, so this gives me a lot of confidence that my training is right on track”. Please visit the Millennium Running website for full race results.